A Sapphire Princess cruise ship drops anchor for the day off the coast of Santa Barbara (Dec. 19, 2010). It’s no surprise that Santa Barbara — with its historic sights, pristine beaches, and gorgeous weather — is a popular destination for travelers worldwide. But this summer many more of those annual tourists will arrive, not by plane but by boat, as 22 cruise ships are expected to dock just off the coast in the coming months. 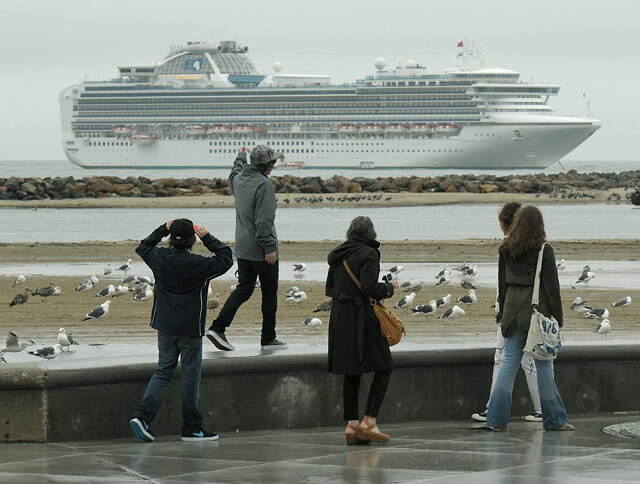 In years past, according to the city’s Waterfront Administration, an average of six to seven cruise ships motored through Santa Barbara waters, so this dramatic uptick is sure to catch the attention of not only area business owners but also environmental groups. The significant influx of cruise ship visits expected in 2013 — particularly during the months of April, May, and October — is due in part to Santa Barbara’s participation at annual Seatrade conventions and its membership in the Cruise the West association. Additionally, safety issues at Mexican and Central American ports are causing cruise lines to look for new places to bring their passengers, noted the Waterfront Administration. On top of the positive economic impact the fleet may have on the South Coast, activists worry there is also the chance it could generate negative environmental effects within the Santa Barbara Channel. Based on information gathered by Oceana, an international organization that advocates for ocean conservation, a single cruise ship can generate up to 168,000 gallons of sewage per day and uses the same amount of fuel as 12,000 vehicles. Current regulations do place limits on where and how cruise ships are allowed to dump their sewage — for instance, they can’t discharge waste within three miles of the coastline — but monitoring is minimal, and ships are not required to track or report their discharges.